Gracious Dube (33) from Hout Bay (Cape Town) has always had an eye for fashion, but never did she think her handmade purses from Rooibos tea bags would one day be sold as a hot fashion accessory in Paris – the fashion capital of the world. Growing up in Harare (Zimbabwe), a career as an artist wasn’t encouraged by her parents, but when she moved to South Africa and got involved with a company called, Original T-Bag Designs in 2006, her creativity took flight. Original T-Bag Designs is a company that started out as a social responsibility project by founder, Jill Heyes, to help impoverished women from Imizamo Yethu (an informal settlement in Hout Bay) to earn money, by making unique arts and crafts from tea bags and boxes. Heyes – a former art teacher – trained Dube in various art mediums and encouraged her to trial new product ideas as a way to boost her income. Whilst holidaying in South Africa, French fashion designer, Carine Khalil – who focuses on upcycling products – was intrigued by Dube’s eye-catching tea bag purses, which she spotted at the V&A Waterfront. Khalil has since worked with Dube on recreating her Rooibos purse for the Paris market, which sells for €26 at Ithemba Design Ethik – a top fashion and decor boutique – owned by Khalil. Dube says the experience of working with Khalil has been awe-inspiring. To make her fashionable purses, which are lined with silk, Dube starts off by drying and ironing about 45 to 50 Rooibos tea bags. 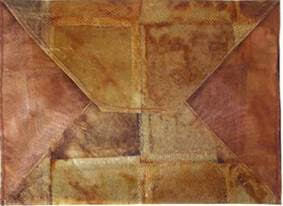 Once done, the tea bags are varnished and either glued or carefully stitched onto the silk. Some purses are also decoratively painted to add to the unique look. Pictured here is Gracious Dube’s modified Rooibos tea bag purse currently being sold at upmarket fashion and décor boutique, Ithemba Design Ethik, located in the fashion capital of Paris. 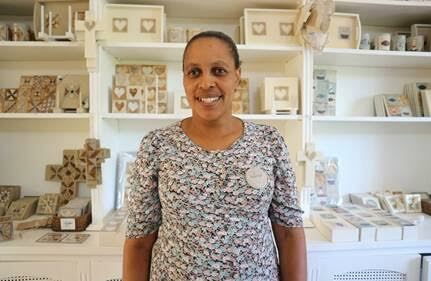 Dube says one of the reasons she specifically uses Rooibos tea bags in her design, is because it’s her favourite tea! “I love drinking Rooibos and it was whilst drinking a cup that I came up with the idea of creating a purse from tea bags. Initially, I tried making it with lots of different tea bags, but the Rooibos tea bags were ideal. Not only do they give my purses a beautiful rich colour, but they also tend to be a lot stronger than other tea bags,” she remarks. 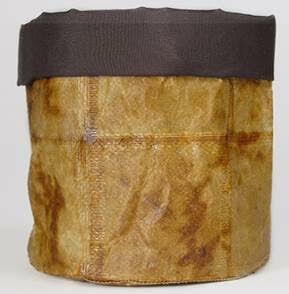 Khalil has also commissioned Dube to make a lampshade and basket from Rooibos tea bags, which are equally big sellers. Gracious Dube’s baskets made from Rooibos tea bags are sold for 20€ from Ithemba Design Ethik – an upmarket fashion and décor boutique in Paris. “Funds generated from my designs have helped me to secure a flat in Hout Bay where I live with my 11-year-old son, Dion and my mom. I’ve always believed in the power of education and am now able to pay for him to go to a good school that will open doors for him. From a business perspective, Heyes has also taught me the basic principles of marketing such as pricing a product right, knowing what products customers want and to never compromise on quality. “I’d like to think that this is just the beginning of a burgeoning fashion business. I have so many ideas buzzing in my head and can’t wait to try them out. My mom and son are also very supportive and just love that my purses are making headlines in Paris. They often help me to prepare the tea bags, so are very much a part of my success,” says Dube. Adele du Toit, spokesperson for the SA Rooibos Council (SARC) says Dube’s products are exquisite. “It’s wonderful to see how artists the world-over are incorporating rooibos tea bags, leaves and even boxes in their art. It’s also a great way to upcycle and gives rooibos tea bags a second life. The concept of painting on or using tea bags in fashion is truly unique and forces artists to work on a canvas that isn’t blank, but is instead imprinted with odd colours and textures. The creative possibilities are endless,” says du Toit. Like Dube, other artists from Original T-Bag Designs also use recycled tea bags that are donated by tea-lovers from all over the world to make anything from animal sculptures (out of paper mache – the final layer of which is decorated with a variety of tea bags) to gift cards, trays, notebooks, dolls, paintings, soap, fridge magnets, handbags and other décor items such as keepsake boxes, heart-shaped door signs/posts, coasters and even beaded jewellery. Products made from Rooibos and other tea bags include purses, handbags, boxes, trays, coasters, paintings and more. Nomsa Ndabambi (pictured above) has been with Original T-Bag Designs since its inception in 2000. The funds generated by the business has helped her to buy a property, which she has turned into a successful B&B in Imizamo Yethu, Cape Town. Rooibos and other tea bag/box donations of preferably dried and emptied tea bags, can either be dropped off at Original T-Bag Designs at the Kronendal, Main Road, Imizamo Yethu or their store at The Watershed, V&A Waterfront. Alternatively it can be posted to PO Box 26227, Hout Bay 7872. For more info about Gracious Dube and the other tea bag artists, visit www.tbagdesigns.co.za; https://www.facebook.com/rooiboscouncil/ or visit their shop at The Watershed, V&A Waterfront.